Seaview, top quality and the Mediterranean atmosphere. Our villas on the island of Brač offer you a breath-taking holiday. The Dalmatian island of Brač is truly paradise for those who enjoy of the sun, beaches and active holidays. Therefore, on Brač it is possible to rent a holiday house and experience the Mediterranean atmosphere of the region first-hand. Are you longing for sun-bathed beaches, stylish luxury and the Mediterranean atmosphere of Croatia? Holidaying in our luxurious villa VITAE on the island of Brač will make all your dreams come true. Do you dream about sun-bathed beaches and deep, blue, crystal clear sea waters? Lose yourself in the charm of the island of Brač and enjoy a heavenly holiday on our estate. furniture and garden design of our property. holiday that will make all your dreams come true. 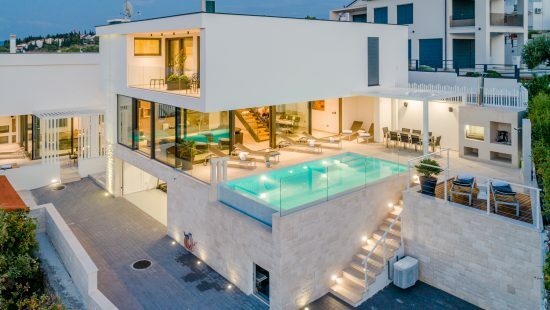 Our classy holiday house VITAE, as well as the trendy villa PAX on the island of Brač, offer you a spectacular view of the Adriatic Sea coast, and merge together state-of-the-art architecture and elegant luxury. 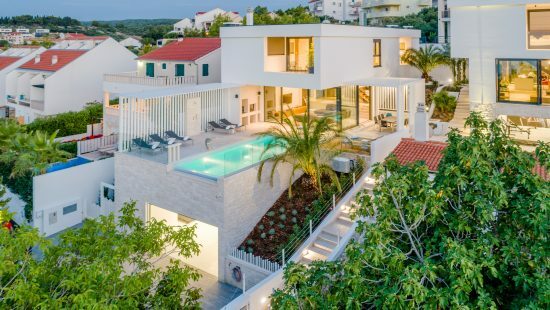 Both luxurious villas were built in 2018 in compliance with cutting edge building standards, and are newly furnished and equipped in order to provide a perfect holiday oasis to guests with high standards. From our seemingly edgeless infinity swimming pool, you can lose yourself in the view of the starry night sky, the coast and the sea. In our holiday house on the island of Brač, we offer you an open view of the sea from frameless windows which can be found almost everywhere in the villa. Our 300m2 estate also contains a spacious, exclusively furnished terrace and a fitness room. Furthermore, there are a ping pong table, a darts board and a PlayStation in the villa as well. Holiday houses VITAE and PAX are located on the west part of the north coast of Brač and are within a few minutes walking distance from the sea and the beaches. The closest town nearby is Sutivan, where you can find a few supermarkets and restaurants. If you would like us to, we can offer you our additional services in order to sweeten your days and provide you with the maximum amount of relaxation and enjoyment. To our guests who express interest in our additional services, we can offer services of a professional chef who will be happy to barbecue for them. We will also be happy to rent a car or a boat for you, so you can explore the island both at sea and on land. Should you need a ride to the nearest airport, we can offer you our sea transport services for short distances. We are fully at your service for any special requests or other things you might need, so that you lack for nothing during your dream holiday in the luxurious villas VITAE and Pax.